← That Time Nestle Gave The Finger to Butterfinger! 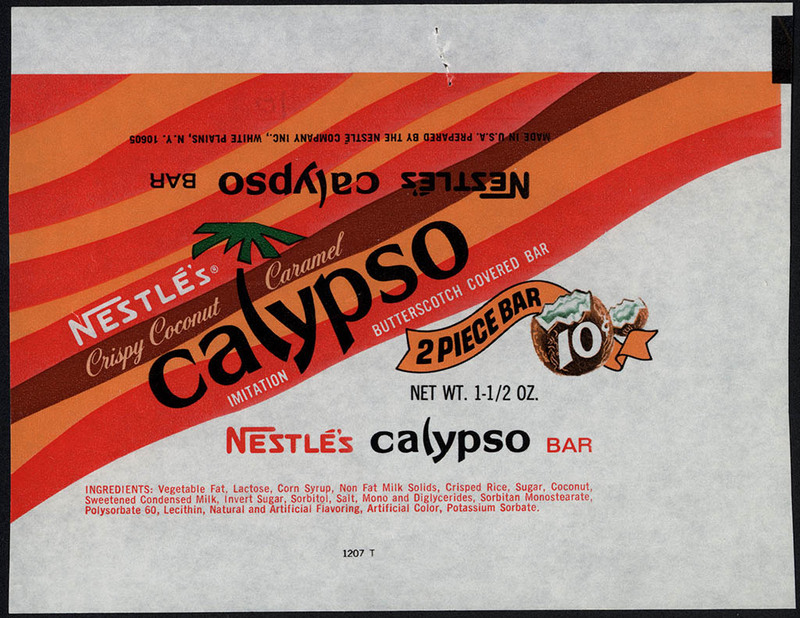 Though I don’t remember the Nestle Calypso bar, I’ve had a 1960’s wrapper in my collection for a few years and it’s pretty neat. Recently I acquired a previously-unknown 1970’s Calypso bar wrapper with a completely different design and thought it would be the perfect time to dedicate a post to the topic. That 1960’s Calypso wrapper has a pretty great design and I’ve always been a fan. But the 1970’s Calypso wrapper I just added to my collection might be even cooler than the 1960’s version. Isn’t that a fun design? I love it! I didn’t even know there was a 1970’s Calypso before finding this wrapper – so it’s great to add it to my collection and fun to be able to share it here today. I hope you dig it, too. 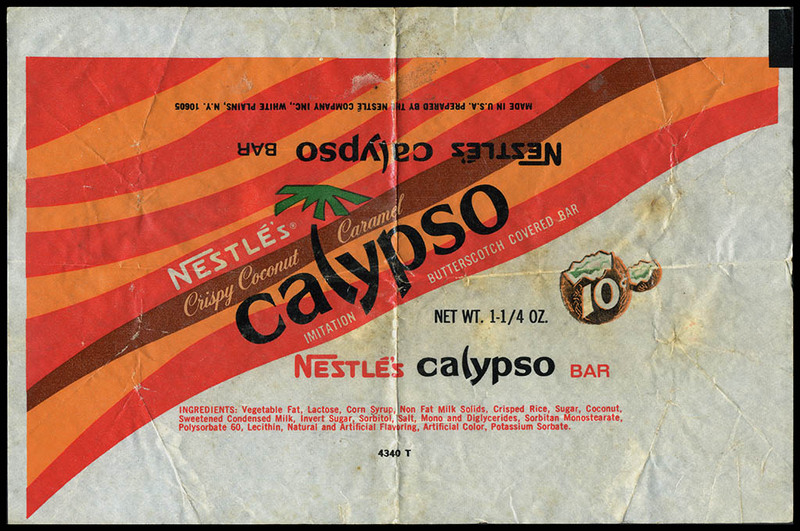 If anyone recalls enjoying a Nestle Calypso bar back in the day, leave a comment. I’m curious as to what these were like. And that’s everything for today’s post on Nestle’s Calypso. See you next time! This entry was posted in 1960's, 1970's, Nestle and tagged 1960's candy, 1970's candy, 60's candy, 70's candy, candy collecting, candy collection, candy collector, candy wrapper collection, candy wrapper collector, coconut, collectible, collecting candy, confectionery, confections, Nestle, packaging, sweets, vintage candy wrapper, wrapper. Bookmark the permalink. 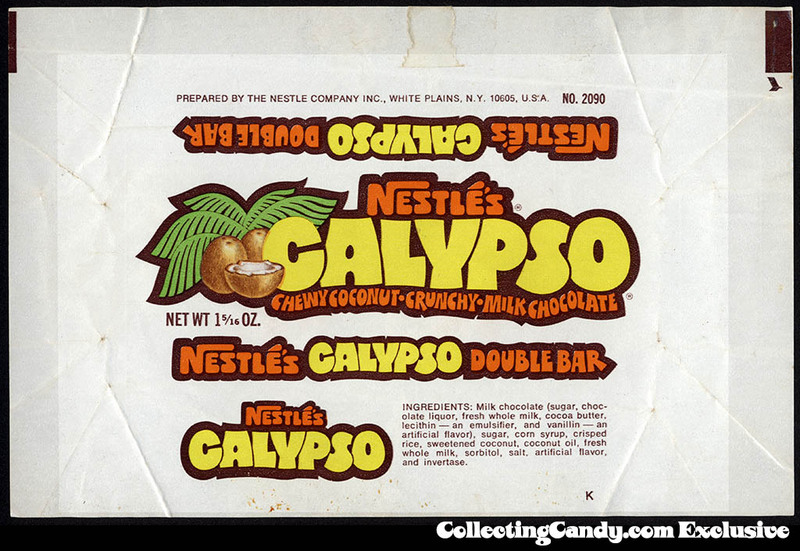 5 Responses to Nestle’s Calypso Bar! They also changed the composition of the bar between the 60s and 70s versions. The 60s wrapper says it is an “imitation butterscotch covered bar,” imitation apparently because there’s no actual butter in it, and chocolate is mentioned nowhere, versus the 70s bar, where it becomes the first ingredient. Oh how I remember them! They were heavenly. I was born in ’61, so I would have had them in the mid to late 60’s and to “whenever” they disappeared. I totally remember being a child and thinking “I hope when I grow up, they still have Calypso Bars, M&M’s, and Miracle Whip”!!!!!!! 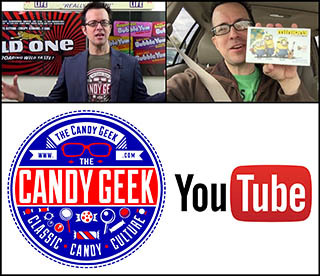 I guess two out of three isn’t bad, but I will never forget this incredible candy bar! I’m sorry for everyone who didn’t get to have them! I’m glad I googled the candy (I was remembering it this evening, for some reason). This post on candy wrappers brought back some good memories! This was a horrible candy. They were originally found in vending machines at schools and businesses. I am surprised they lasted as long as they did. They had a butterscotch like flavoring mixed with cocanut covered with chocolate. These were wonderful. They didn’t last long but it was one of the few you could find that were butterscotch flavored. I don’t remember any chocolate in the original candy bar, maybe that added that in the later version. Chocolate doesn’t sound like it would have been good in this candy. The original was caramel, coconut covered with Butterscotch. Fabulous!! !